The Synology DiskStation DS213j is a 2 bay NAS device that has 512 mb of Ram. It also has a 1.2 gigahertz Marvell Armada 370 processor. The DS213 is capable of accepting two 3.5 inch disks, two 2.5 inch disks, or a combination of the two. While this may be an entry level device, it still has the same DSM operating system that is of high quality, which one would expect from some of the more expensive NAS systems that are offered by Synology. The NAS operating system has a major impact on how usable it is. It also determines how useful it is going to be for your business. If you currently do not have a dedicated IT support, it will be extremely important to choose hardware that is going to be easy and simple to manage in order to make things easier on you. The DS213j is one of these simple to manage devices. It is a bit more complicated to install a hard disk in the DS213j than in some of the other more expensive models that are offered by Synology. The main reason for this is because you will have to open the chassis of the DS213j in order to screw the disks into the cage. A device such as the DS212+ from Synology will allow you to take the drive rails off from the front of the device so that you can mount the hard disks into those. Once you have installed the hard disks, you can then connect the NAS to your router and you will need to locate it on your network in order to install the operating system. You will be able to install the operating system either by using the CD that was supplied or by downloading the operating system from the company’s website. If you choose to use the CD that was provided to install the operating system you will be able to update to the latest version at another time. You can do this either by using the DSM operating system or you may also download it to the USB drive. The packaging for the Synology DiskStation DS213j is relatively plain. 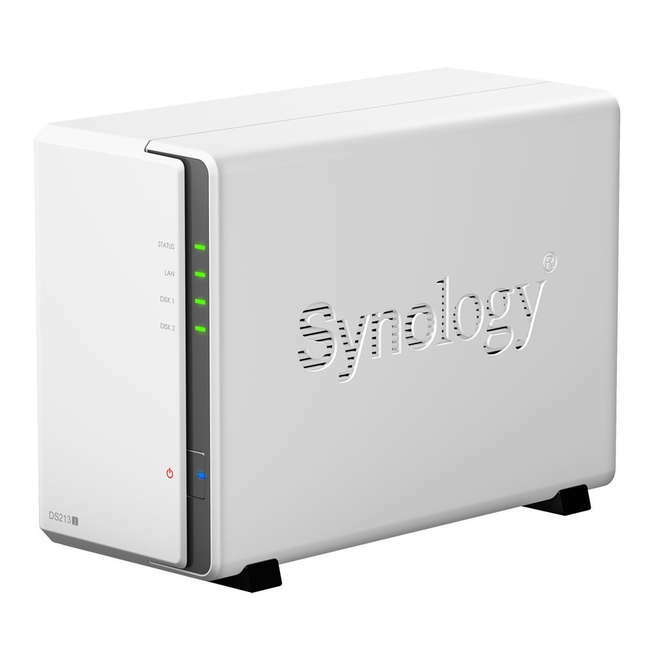 It has a model name sticker on the box, which is the only difference between the packaging for it and the other recent devices that have been offered by Synology. Inside the box, the DS213j is in its own cardboard container. It is wrapped inside of foam and has bundled extras that are each in their own boxes. Like the packaging, the boxing of the Synology DiskStation DS213j NAS is plain and simple. 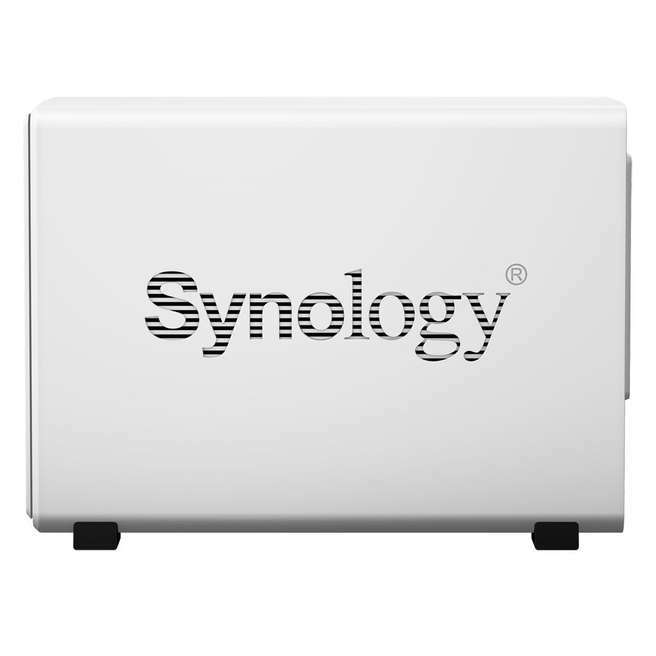 Synology logo looks quite neat though! Along with the bundles you will find a selection of screws that are used for installing the storage drives. There is a quick guide that provides a high level view of what is needed in order to begin using the device. Synology also provides a software CD which includes a full installation guide. There is also a user’s manual provided in PDF format. There is a separate power unit that is supplied with the diskstation. An RJ-45 LAN cable is also included in the box. Essentially, everything that is needed in order to get the DS213j up and running has been provided, except for the hard drive. The interface of the DSM is quite good. There is an extremely helpful quick start wizard that will provide you with a guide through all of the critical settings. The wizard will also provide you with prompts in order to help you configure all of the essential features of the product. For example, if you go to the file station, which is the file manager for Synology, but you do not have any shared folders, you will be prompted to go directly to the configuration screen for shared folders. This is accessible through the control panel as well. In order to set up the SMB shares, you will simply hit the create button, name the folder, and then use the tick boxes to set the permissions. You will be able to enable guest user access. This will allow anyone on your network to be able to write or read files that are stored on the DS213j, if this is what you want. In addition to being able to share the folders using SMB, you will also be able to set up the DS213j to provide remote FTP access. There are several additional apps that can be installed from the Synology Package center that will provide other features including media servers, mail servers, and even intranet or internet sites with content management systems. When compared to some of the other processors that are more powerful, the installation of the diskstation DS213j may seem a bit slow, but it is clearly designed and responsive. If you are familiar with Microsoft Windows or Linux window manager you will feel right at home using this DSM. Since this is a 2 bay NAS, the default RAID system from Synology is the Hybrid RAID. This will effectively allow you to build a RAID 1 array, which will mirror your data between the 2 disks. This ensures that you will not lose any data should one of the drives fail. 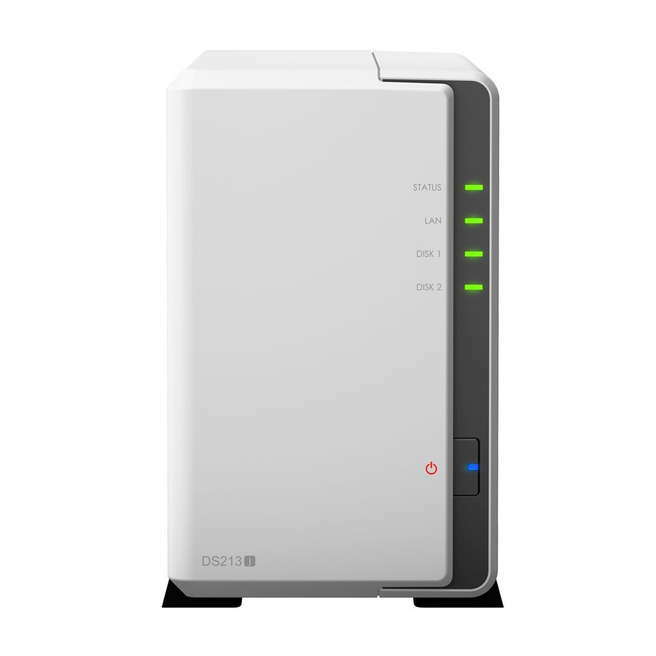 It is also possible to configure the DS213j to RAID0 in order to create a larger storage volume. However, this is not recommended because it would mean that your data is not going to have any type of protection against the hardware failing. At the back of the DS213j, next to the Ethernet port, there are 2 USB ports that allow you to attach USB drives. These attached drives can then be used for storing back up files or as additional storage. The restore and backup menu of the DS213j makes it easy to schedule backups on a regular schedule so that the vital data that you store will be copied to the USB drive from the DS213j. The USB drive can then be detached and stored in a secure manner. The USB ports of the DS213j can also be used to turn the NAS into a print server. You may also attach a blue tooth dongle or a Wi-Fi adapter in order to increase the connectivity of the NAS. There have been several tests run on the NAS. One test used two 3 GB hard disks. When these disks were configured using the Synology Hybrid RAID, the storage capacity that was provided was 2.68 TB. Each generation of Synology NAS brings a bit more power. This means that you will be able to see faster speeds throughout than what you have seen on the past 2 bay j series enclosures. In an SMB transfer test, the file write speed was 74.5 megabytes per second. The read speed was 56.4 megabytes per second. This is an average of 65.5 megabytes per second. The small file speeds are a bit slower and this is the case with the DS213j. The write speed is 13.1 megabytes per second and the read speed is 17.5 megabytes per second. This is an average speed of 15.3 megabytes per second. When the NAS is created as an iSCSI target it will look and act like the local hard disk. However, it is still accessed through the network. The iSCSI targets will provide quicker transfer speeds. The DS213 is no exception as small file write speeds were 42.1 megabytes per second and the read speeds were 28.6 megabytes per second. This produced an average speed of 35.3 megabytes per second. Larger files were written at speeds of 53.7 megabytes per second and the larger files are read at 55.6 megabytes per second. This is an average transfer speed of 54.7 megabytes per second. Faster speeds were produced by the DS213+. The DS213j is faster than the DS213air. Even with being one of the cheapest NAS enclosures offered by Synology, the transfer speeds of the DS213j were better than some of the more expensive ones available. This makes it one of the best budget buys. Synology DiskStation DS213j has 2 USB2.0 ports and an ethernet port. It’s clear that USB 3.0 port and another ethernet port wouldn’t hurt, but aren’t necessary. Languages: Turkish, Portuguese, European, Brazilian Portuguese, Polish, Russian, Dutch, Swedish, Norwegian, Danish, Spanish, Italian, French, German, and English. Using the DS213j allows you to sync your files using cloud station. This cloud station offers enhanced privacy and security. The NAS server will push each of your files to all of your devices so that the most up to date versions will be available for you to access from any device at any time, no matter where you are. You can sync files of various sizes. The maximum sized file that can be synced is 10 gigabytes. Syncing and sharing files among your group members, there is an almost unlimited number of shared folders and user accounts available. SSL encryption supported to provide higher security. DiskStation can be accessed outside of the LAN using Quick Connect. Quick Connect has been designed in a way to help you set up a connection without needing to configure a router setting first. When Quick Connect is enabled you can use the cloud station in order to sync the files between your work and home computers. In addition to DS cloud, Quick Connect will support mobile remote access to DS audio, DS file, and DS photos. The video station will keep all of your videos, television shows, and movies categorized neatly so that you will always be able to access the ones that you want. If you equip your DS213j with a USB DTV tuner, it will easily stream and record live television shows. In addition, you can manage and store movies, home television shows, and etc. all in a central location. Create smart albums so that photographs that have the same sorting rules will be automatically grouped into the same album. Hardware assisted locking allows you to create several VMs that are 9 times faster. This particular Synology DiskStation has passed the Windows Server 2012 certification for providing businesses the ability to leverage the functions of Microsoft storage solutions such as live storage migration, Hyper-V replica, storage capacity, and capability. Synology provides users with a great amount of support for LDAP and active directory in order to provide businesses with the simplicity and flexibility that they need in order to manage their complex organization. Joining one of these directories will allow you to gain a single sign on to the NAS from Synology using their domain account. IT managers will be able to host an LDAP server and to centrally manage account access and control easily. Using the same domain account the end user will also have access to several DSM services. There are several advantages of joining the Active Directory Domain Services from Microsoft. IT managers who join will be able to centrally store user names, passwords, device names, as well as other information all in a single place. This can enhance the security of the network, and reduce the cost of overhead. When the Synology NAS joins an active directory, the IT manager will not need to create another account and duplicate the security information. End users will be able to use one domain account to access the Synology NAS. Synology High Availability provides an easy to use, reliable, failover mechanism that can recover from service and physical failures. The heartbeat feature allows both a primary and a backup server to determine whether the other one is alive. When one server fails, the other will automatically fail over resumes and resources automatically. SHA should be installed on your storage servers in order to minimize the downtimes. 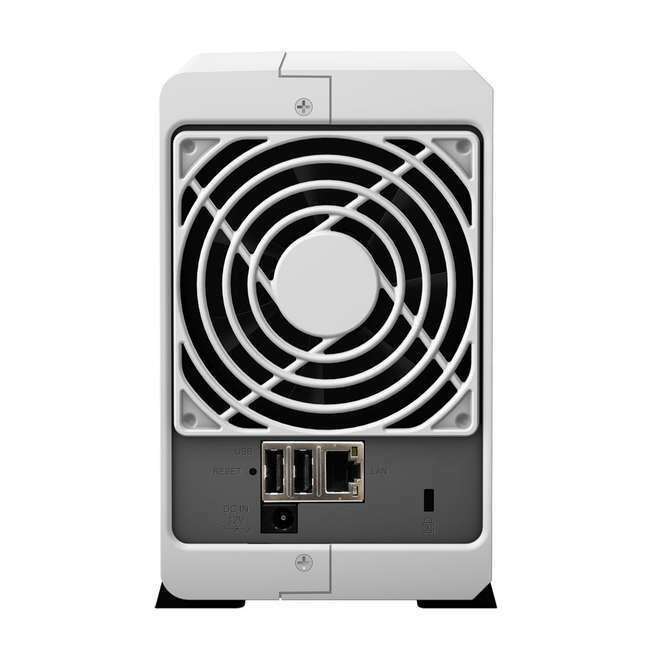 Synology Diskstation DS213j is a good choice for a budget buyer. It has just the (limited) features what are needed, and nothing more. The DS213j comes with a 1.2 gigahertz processor as well as 512 megabytes of DDR3 ram, which ensures operation that is lag free. While the enclosure does not come with a hard drive, you can fit both a 3.5 inch drive and a 2.5 inch SATA II drive right into the back of the server providing a maximum capacity for storage at 8 TB. In addition to the enhanced storage possibilities, you also have the two USB 2.0 ports that will allow you to connect a number of peripherals including external hard drives, USB thumb drives, printers, and even more. It is also easy to connect the NAS server to a LAN as the device is equipped with a Gigabit Ethernet port integrated directly into it. This port is located right next to the USB hub. Overall, the DS213J Diskstation from Synology offers a complete attached storage solution over a network. It provides you with everything from virtualization support to multimedia streaming and domain integration. Whether using the NAS server for either your home or your business office, you will be able to rest assured that the server is going to provide you with the support that you need in order to save and distribute your files efficiently and effectively. In addition to the virtualization support and the domain integration, you will also benefit from the mobile device integration and the enhanced cloud services. This is a perfect solution for both individuals and businesses alike.